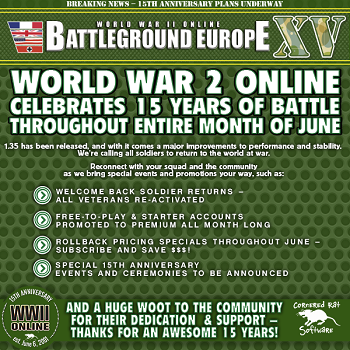 Inviting all veteran players of World War II Online to join us as we celebrate our 15th Year Anniversary. This is a big event for the game, community, and developers. Veteran players can be our guest as we offer a special month long Welcome Back Solider event. Along with this, all players will be Premium Accounts, and we will offer special pricing to those who wish to take advantage of the $9.99 per month subscription*. This is a special time for us, and we aim to make it a month that everyone will remember. The Campaign has not really changed much in the last week. The Allied Forces seem to have stopped the axis in many areas. It is too early to say this is a map turn around, but there is one thing certain, and that is this map is not over yet, and it could go either way. Your team is requiring your help, join them on the field and help your side win this campaign. Last Thursday 1.35 went live! The Dev Team did a terrific job with the roll out, and I would like to commend them and the QA Team on this patch. Both teams worked really hard to allow this patch to go to live, and from a team made up of mostly volunteers, that is saying a lot. We are aware that some players have had issues with the release; the good news is that the dev team have a good handle on the issue and are working to get it fixed. This patch is not only a major update to the game, but a strong sign that the new team has a grip on the game and how it is put together. The update included a major rewrite of lots of the game. This was no small task. This not only provides a more stable platform for gaming, but also gives a better platform for future development. 15 years ago, this community was very small, yet full of excitement. Very few members of the community had access to the beta and the release was announced to be soon. Many members of the community camped out at the orange boards waiting for every update that they could get their hands on. Anything would make them happy, a message from MO that things were going well, or a sneak peek from RAFTER with a new screenshot published. Squads were starting to form, and many had plans for the first day of war. Several community members had already planned on calling in sick, and some just took a vacation day. Who knew then that we would still be here today 15 years later? It is time to say thank you to you the community. We have always realized how great this community is. Some of you have been here since day one, and still as loyal as you were before the game was released. There are still some of the original beta testing team here, and they continue to test the game as they are needed. Through the years we have seen many great times together. Several times the players have come together to meet in person all over the world. Many long lasting friendships were formed around this game. From everyone at Cornered Rat Software, we thank you for your years of dedication and your help to keep this game going. Without your support there would be no game today. Thanks to you there is a strong hope for tomorrow. To Celebrate our 15th Year Anniversary, and as a thank you to you and the rest of the community, we are pleased to announce that we will celebrate in through the month of June. On June 1st veteran players are invited to rejoin the battle as we unlock all veteran accounts and allow them to have premium accounts through the month of June for free. Every player who has played this game since day one is invited to join us on the battlefield as we rage war during this special time. During the month of June the Free to Play players along with the Starter Account Players will be bumped up to Premium accounts. This will allow every player on the field to have access to what the Premium account players have. NEW PLAYERS NOW IS YOUR TIME! During the month of June, new players can create a new account and have access to the Premium Account weapons no matter if they start a Free to Play account, Starter account, or Premium account. CRS will be offering special pricing to those players who wish to take part. The price will be on a sliding scale through the month of June. Once a player selects this subscription they will have that price until they modify their subscription or unsub. First two weeks of June players can subscribe for $9.99 per month. The third week players can subscribe for $12.99 per month. The forth week till the end of the month, players can subscribe for $14.99 a month. During the Month of June players who wish to prepay for 12 months will get the special rate of $129.99. I am working with others to hammer out the details of the events, but plan on one being held Saturday June 4th in the Training/Event server. I will publish more details on these events next week in the community report. We hope to have more during the month, but I need to finalize a couple of things before I can say for sure. We are planning to hold a parade while we celebrate 15 years of non-stop gaming, and the future of the game. Watch for more details next week in the community report. Things are happening fast around here and lots of things are happening. COMMUNITY MARKETING TEAM LOOKING FOR HELP! The Community Marketing Team is gearing up for the month of June. On Thursday I will post information in the forum along with graphics. This information will be for anyone who would like to help spread the word about our celebration. Players can help by taking this information back to their squads, or other forums and sites that they frequent. There are millions of gamers out there who have never heard of our game, We are asking for your help to bring it to the attention of everyone we can. The Community Marketing Team will be distributing information to media sites and other sites. If everyone teams up together we can show our game to many thousands of potential new players. They putting out a call for anyone who would like to help with the video by doing the voiceover. If you would like to do it, or know someone who would, please email me and we will get everyone together to make it happen. The Screenshot Contest continues to go on. We want everyone to be part of this contest and hope that you will take part too. Everyone has the ability to snap that one perfect shot of action and end up winning this contest. Submit your screenshots in this thread. At the end of the month, a panel of Rats will go through the screenshots and select the top 10. The community will then select the top screenshots from those 10. 3rd place winner will receive 1 month. Wednesday May 18th, 2016 is a day we had all been waiting for, in great anticipation, yes the release of 1.35 on the live server. At approximately 22:38 cst, Server time, the announcement came on the forums followed shortly in game that the servers will be switching to 1.35. Then on Thursday morning it came 1.35 went live and yes there were a couple little things but overall it was smooth. As the Axis Commander in Chief I would like to give a big Salute to all those in CRS that worked tirelessly on getting to this stage and it is greatly appreciated. Looking forward to what the future brings for BattleGround Europe, aka. wwiionline to us old timers. Week 2 of Campaign 124 has been a grind for both sides, one day we the Axis push and gain ground here or there and then the Allied take it back but Axis morale is high and strong, as is our will, and we will keep bringing it until we sip that French wine in those French, or British, Factories. Late this week we reached Tier 1 and players are excited to move on and get the weapons that come with this. The Panzer IIIH is a welcome addition as is the Semi Auto and the troops have been itching to get them in action. everyone is pumped now that 1.35 is live and running very well, have only heard of a few little things, and Campaign 124 is turning into a grind with next to no movement then swings in one direction only to be reversed in the next day or so. Intel also reports of some great battles taking place so, if you have ever wanted to come back and see where things are at, now is the time to sign up and log in. Over the past week I have had some of my best pilots doing scouting runs in search of the ever elusive Waver25. Intel has also been coming from some unnamed sources and I feel we are getting closer to bringing this Rabbit out of his little hiding hole. …...just in waver25 spotted in Merbes, Sunday May 22, 1941…. I am also looking forward to the Axis enjoying some French wine in Paris or tea in England in the near future. *9.99 is a limited time only price that is outlined above. Great promo, but you should have coupled it with (or immediately after) your steam release or large marketing campaign IMO. Hopefully supply will be increased a LOT for this event.